Did Owen tip the scales for Boston in the competition for General Electric’s new headquarters? Owen is the geeky young programmer featured in the self-deprecating advertising campaign promoting GE as a 21st century digital industrial company. In reality, engineers, coders, programmers and designers are increasingly the jobs GE is trying to fill —“building the software and analytics to bring together the power of machines, big data and people”—and that makes Boston, with 55 colleges and universities, a preferred location. Plus Massachusetts spends more on research & development than any other region in the world, and Boston attracts a diverse, technologically-fluent workforce focused on solving challenges for the world. It’s a good bet that Owen and the millennials he represents are more likely to be found in or attracted to Boston’s Seaport District—a dense, vibrant, walkable city center—than to suburban Connecticut. So look for GE to be more competitive for top talent. But in spite of all of the reasons that made Boston GE’s top choice, GE sought and will receive incentives and subsidies from Boston and the Commonwealth of Massachusetts to the tune of $145 million! This to a company that is valued at more than $250 billion. Boston recently landed another headquarters facility. Silicon Valley software design giant Autodesk is moving its architecture, engineering and construction division from Waltham, Mass. to a new location in the Seaport District. Autodesk is a smaller company—No. 862 on the Fortune 1000 while GE is No. 8—and it’s bringing 170 jobs against 800 for GE. But landing Autodesk was a good deal for Boston. According to Boston officials, Autodesk is not receiving any incentives to move to the city. In a CityLab column from The Atlantic, Richard Florida concluded, “The reality is that these incentives are a drop in the bucket for a company like GE. In fact, GE turned down reportedly bigger incentive packages from states like New York. Ultimately, all these incentives really do is take money out of the pockets of Boston and Massachusetts taxpayers—money that could and should be used to reduce poverty and improve education in the city and state’s many disadvantaged neighborhoods. I’m with Florida on this one. A decade ago we were talking about young professionals and empty nesters moving to city centers. Now, it seems like everybody wants to be in town. Urban revitalization. Downtown redevelopment. Gentrification. There are all sorts of charts and graphs that illustrate this trend everywhere you look. Here are just a few. 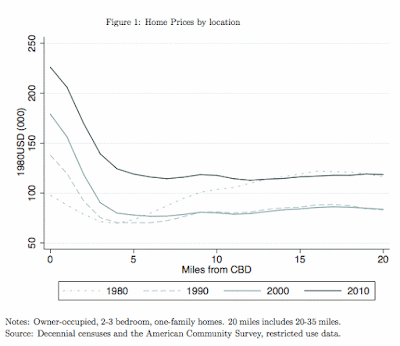 The following chart shows that housing prices in urban centers have been rising 50% faster than those in less central locations since 2000. When the housing bubble burst, that gap was virtually unaffected and it has been growing again since 2013. And, the rent gradient, which tracks the change of housing prices as you move away from the city center, has gotten much steeper since 1980. 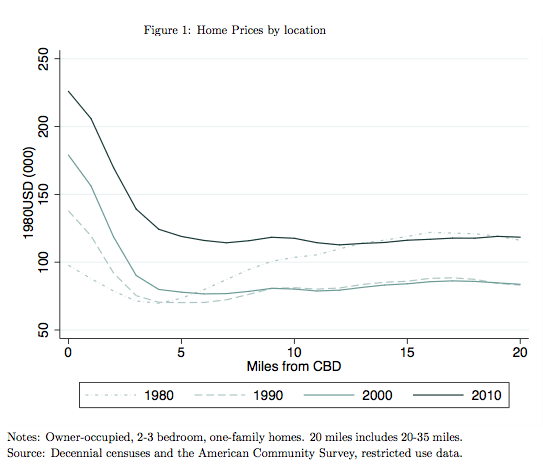 People are willing to pay a much higher premium to live in the city now than they were in 1980, when housing prices 15-20 miles outside of the city center were nearly 25% higher than those in town. 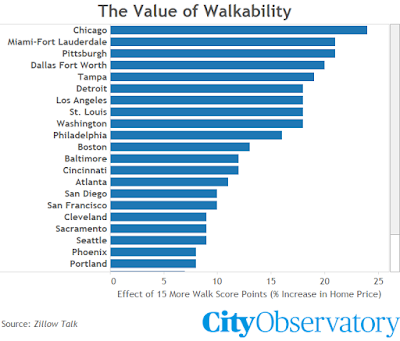 There is a strong correlation between increases in home values and Walk Scores. 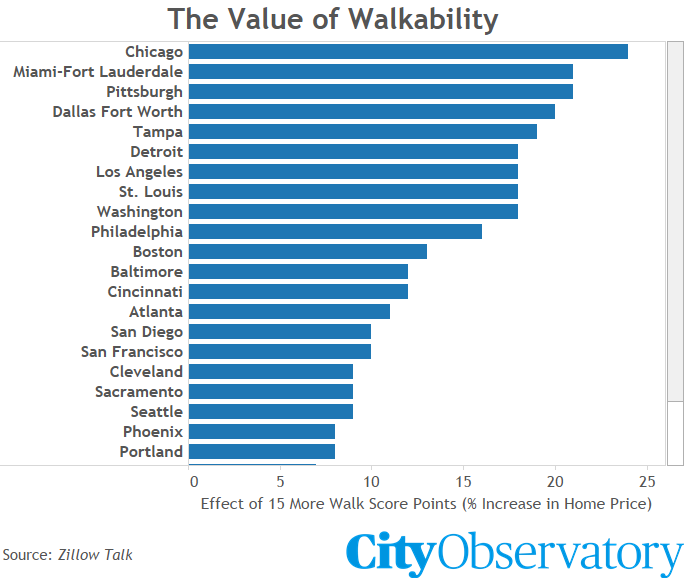 According to Zillow Talk, the 2015 book by the CEO and Chief Economist of Zillow, houses in walkable neighborhoods have recovered most and fastest. Cities, eh? They’re the big thing. Joe Cortright argues that these charts show that cities are becoming more important to the economic health of the country. The 20th century saw a residential exodus from city centers, but the residents have returned en mass in the 21st. There are more people who want to live in walkable, transit-served, urban neighborhoods than there is housing in said neighborhoods. There’s a lot of talk about how to create more great, urban neighborhoods. Here’s what no one is talking about: the ‘burbs. The car-dependent, 1/4 acre lots situated on safe cul-de-sacs, tucked neatly around 18-holes of golf, swim, and tennis; the big-box stores; the economy-sized-box stores; the malls; the shopping plazas; the asphalt seas of parking spaces. The only people who are talking about the suburbs are asking if they have a future. After the housing bubble burst and people abandoned the homes they couldn’t sell or were forced out in the process of foreclosures, we got a glimpse of a future of the suburbs: McMansions with boarded up windows, dead grass, pools full of algae. Empty driveways and garages lead to empty shopping plazas, dead malls, and overgrown golf courses. Is it really the end of an era? Will the suburbs someday look like abandoned gold rush towns? The physical remains of a once booming idea of utopia? Planetizen blogger Michael Lewyn wrote last week that some suburbs do have futures, but only some. So, what about the suburbs? The utopian dream of Frank Lloyd Wright was suburban. The whole point of suburban expansion was an escape from the dirty, crime-ridden city to a dreamland where everyone could have their own greenspace. Who needs a pocket park down the block when you've got a yard? Suburbia was the darling of the urban planning world in the 20th century. Cities were crowded. People wanted space and fresh air. They found it in the suburbs. Now, urban planners seem ready to abandon the suburbs as ill conceived, traffic nightmares where no one wants to live. They think we need to create more great, urban neighborhoods so that everyone can affordably live in the city. Because all the studies show that everyone wants to live in the city. But, that's just not true. Plenty of people like living in the suburbs. Especially people with kids. And, the fact is, cities still have higher crime rates and they're still crowded. So, while we’re thinking about how to create more great, urban neighborhoods, let's not forget about the suburbs, where scores of people choose to live. Can we make suburbia more appealing? Can we bring some of what people love about living in the city to the suburbs and still keep what people value about suburban life? How do we make sure our suburbs don't become ghost towns? That's something we should be talking about. In the interest of full disclosure, I should add that I do not live in the suburbs... not exactly. I live in the city of Los Angeles. It's not the golf course subdivision where I was raised in suburban Atlanta and I live in a "very walkable" neighborhood (according to walkscore.com), but I am nevertheless car dependent for some things and I love my yard. Over the next year, it is likely that the topic of the minimum wage will continue to dominate debates at both the national and state levels and in the voting booths. Effective July 2009, the federal minimum wage remains $7.25 an hour. Currently 29 states and the District of Columbia have set minimum wages higher than the federally mandated minimum wage, and many of those increases have happened over the past two years, suggesting a growing demand and need for increased wages for workers at the lowest end of the wage spectrum. As of January 1, 2016, 14 states began this year with higher minimum wages, due either to new laws or to cost of living adjustments. Today, $7.25 an hour does not go nearly as far as it once did. The real value of the minimum wage has been steadily decreasing since 1968 when the minimum wage was $1.60 an hour. According to the inflation calculator that the Bureau of Labor Statistics provides, $1.60 in 1968 had the same purchasing power as $10.91 in 2015. (1) Stagnant wages and rising prices have left millions of low-wage workers with less money to make ends meet. 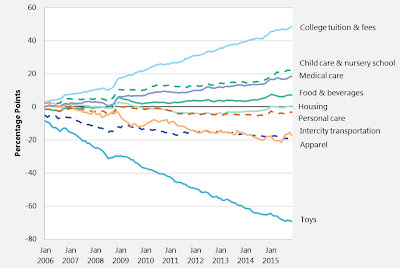 The nearby figure offers additional context and shows that not only has the minimum wage not kept up with inflation, the costs for basic survival (food, health care, etc.) have continued to rise at even faster rates. 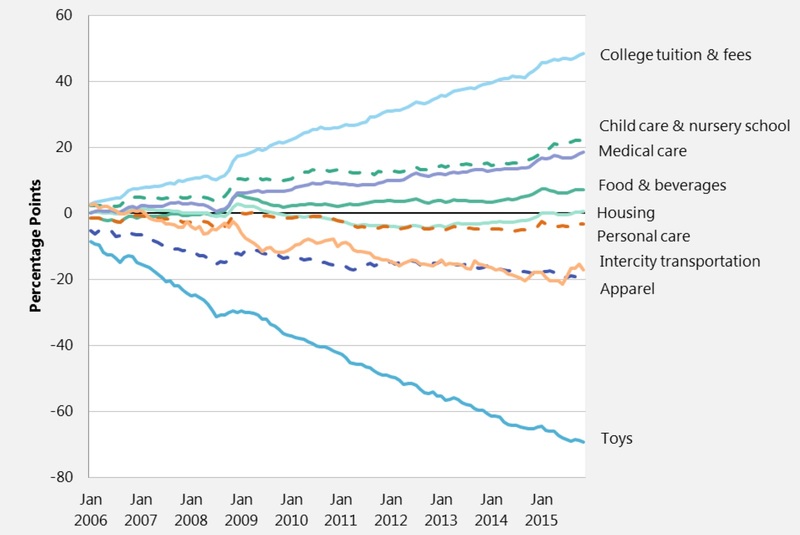 While the price for items like clothing and toys have fallen, the cost for goods and services that improve a person’s well-being have continued to outpace the inflation rate. Further exasperating the issue, many of the tools and services needed to lift oneself out of poverty, such as child care and higher education, have continued to become further and further out of reach. This information is not new, yet the way that some states and policymakers address the declining value of the minimum wage and the impact of low wages on our communities has begun to change in some areas. There are many opportunities to directly affect millions of low-wage workers through policy changes. I’m hopeful that in the coming year we will see more positive changes and continue to refuse to settle for status quo. (1) Calculated by using the average Consumer Price Index for all goods and services purchased for consumption by urban households. (2) “Characteristics of Minimum Wage Workers, 2014.” Bureau of Labor Statistics. April 2015. It is easy to put the ‘season of giving’ mentality commonly associated with December’s holiday season in the rearview mirror as we embrace a new year, but the month of January provides as good an opportunity as any to remember that a giving attitude should be adopted all year long. It is in this month that we celebrate the life of Martin Luther King, Jr. via a federal holiday on January 18 that is now used as an opportunity to promote community service in places across the country. Dr. King led a life of service and community activism that few before or after him will ever duplicate. The fact that we use his birthday to encourage volunteering in one’s community is most appropriate, since few other Americans can claim such a legacy rooted in philanthropy as his. Volunteering in one’s community and other forms of civic engagement are also vital for both the planning and implementation of the community and economic development strategies we here at Market Street Services help develop. Civic engagement and community collaboration are at the core of the work that we do on behalf of our clients. We always emphasize to our clients that we are mere facilitators in the strategic planning process. The strategic plans born out of the processes we facilitate are ultimately owned by the community and implemented via an implementation framework that is rooted in civic engagement. All of our processes are led by a diverse steering committee of community leaders from the public, private, and non-profit sectors who volunteer their time to be champions for community change. It is not unusual to have CEOs of multi-million dollar corporations, elected officials, non-profit CEOs, and other accomplished professionals serving on these steering committees. Their commitment to the process and the expertise these community leaders bring to the table help to transform communities in ways that no single person or entity could accomplish on their own. This “giveback” attitude is what makes civic engagement so powerful, and when this mindset is adopted by the broader community, the sky becomes the limit. Over the years, Market Street has had the pleasure to work in communities that have excelled at harnessing the power of civic engagement and volunteer leadership to fuel the momentum needed to achieve strategic goals. In Watertown, SD – a town of roughly 22,000 people – Market Street facilitated a community visioning process alongside a volunteer-driven steering committee that was committed to an inclusive process that welcomed the thoughts of all members of the community. Their efforts led to an astounding 2,200 resident responses to an online survey that helped to inform the vision planning process. As a share of the total population, the Watertown response rate easily eclipsed all other online survey response rates in other communities where Market Street has worked. The ability of the volunteer-led steering committee to engage the community in such an unprecedented manner and the willingness of so many community members to participate in the visioning process speak volumes about the civic capacity of this small rural town. A similar story emerged in Des Moines, IA where Market Street worked with the Greater Des Moines Partnership in 2011 on a five-year vision plan for Central Iowa dubbed, “Capital Crossroads.” The region’s support for the strategy was tremendous and widespread. Key community institutions like the United Way of Central Iowa, Iowa State University, and the Community Foundation of Greater Des Moines were just a few of the initial sponsors of the Capital Crossroads movement. The support of a broad array of regional institutions and the leadership provided by over 50 business and regional leaders who volunteered their time on a steering committee generated a great deal of energy for the process, from kickoff to implementation. A total of almost 4,300 members of the region provided input during the process via two online surveys. The total number of responses is a record for any community where Market Street has worked. In total, some 5,000 members of the region engaged themselves in the planning process by providing input through online surveys, one-on-one interviews, and focus group discussions. The region’s engagement in the process didn’t just stop there. The Capital Crossroads strategy’s implementation was launched in the fall of 2011 and organized around 11 strategic “capitals” – or goal areas – that include within them the strategy’s specific implementation activities. These 11 strategic capitals have been guided by their own committee of volunteers who have devoted countless hours to leading the implementation of Capital Crossroads, all in the name of being passionate civic leaders. Since implementation, some 500 members of the community have volunteered to serve on one of the strategic capital committees. Some of what I just described can be summed up by what is referred to as “collective impact,” a term first mentioned in a 2011 Stanford Social Innovation Review article that continues to gain steam in public policy circles. Collective impact can be loosely defined as the process that results when a collection of organizations coordinate together to address complex large-scale social issues and opportunities in a manner that no one organization could have otherwise pursued on their own. It is a process that is engrained in collaboration, community engagement, and goal setting. In other words, it defines much of the community and economic development work that we do at Market Street. Community institutions that pursue their work in independent silos are only handcuffing themselves in an age where social connectivity and globalization reign supreme. The volunteer-driven community outreach efforts and results witnessed in Watertown, Des Moines, and many of our other client communities offer validation to the collective impact model and case study examples for how many of our national and global challenges ought to be tackled. Despite the success stories we have witnessed over the years of passionate volunteers and communities that place a premium on community engagement, volunteer rates on a national level are lower than they have been in over a decade. According to a report released earlier this year by the Bureau of Labor Statistics (BLS), 25.3 percent of Americans volunteered in the 12-month span from September 2013 to September 2014. The BLS defines a volunteer as any person who performed unpaid work through or for an organization in the past 12 months. Clearly, this trend is worrisome for a number of reasons. Chief among them is that it may indicate that people are becoming less engaged in their communities, and by extension, less invested in their community’s future.